I won a hunt on the Tejon Ranch in Southern California and was quite surprised at the set up there. The lodge was a one-year-old, early American western decor with tile floors and countertops. The bedrooms sported a very comfortable bed with battery-powered alarm clocks. My guide was Larry Johnson, a 21-year-old well versed in hunting the Tejon Ranch. We hunted the first night I got there. We saw three hogs down in a river bottom. After circling a mile or so to get the wind right and stalking to within 30 yards of two wet sows and a 150-pound boar, I got a good look with the binos and decided not to shoot. 3:45 a.m. came soon the following day. We were off to some of Larry's favorite glassing spots. Hog movement was very slow, only seeing two sows. As we were about to call it quits for the morning hunt, we saw a deer run up the side of a mountain. Curious as to why it was running, we took a good look with the binos and spotted a single hog coming from the brush. I guessed him to be around 200 pounds so off I went on a stalk. An hour later I caught up with him scratching on a tree. I took advantage of that and moved in to 25 yards. The wind was perfect as I waited for him to come away from the tree for a good broadside shot. 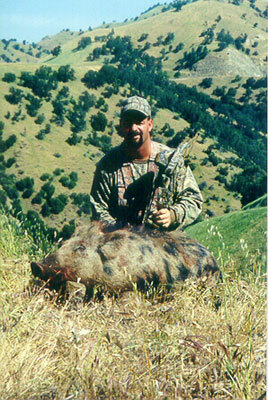 One arrow and it was over  the double-lunged hog jumped 15 feet, turned to look at what pinched him and fell dead. The best part of the whole thing is, it was all downhill.